The depression ended quickly and why? Because the government did nothing about it. The panic of 1819 was America's first great economic crisis. And this is Murray Rothbard's masterful account, the first full scholarly book on the topic and still the most definitive. It was his dissertation, published in 1962 but nearly impossible to get until this new edition, the first with the high production values associated with Mises Institute publications. 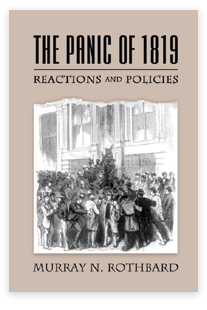 The American Economic Review was wild for this book when it appeared: "Rothbard's work represents the only published, book-length, academic treatise on the remedies that were proposed, debated, and enacted in attempts to cope with the crisis of 1819," the reviewer wrote. "As such, the book should certainly find a place on the shelf of the study of U.S. business cycles and of the economic historian who is interested in the early economic development of the United States." And specialists have treasured the book for years. It is incredible to realize that some American historians think of M.N. Rothbard as the author of this book and nothing else! Rothbard tells the story of a disaster that could not be attributed to some specific government blunder. It seemed to originate from within the economic system itself. Its cause was not obvious to observers at the time. Confronted with something new, the panic engendered much discussion and debate about possible causes and remedies. As Rothbard observes, the panic provides "an instructive picture of a people coming to grips with the problems of a business depression, problems which, in modified forms, were to plague Americans until the present day." The panic of 1819 grew largely out of the changes wrought by the War of 1812, and by the postwar boom that followed. The war also brought a rash of paper money, as the government borrowed heavily to finance the conflict. The government depended on note-issuing banks spread throughout the country. All of this put tremendous strains on the banks' reserves of specie held against such notes. This would inevitably lead to suspension of specie payments in some parts of the country in 1814. Freed from the shackles of hard money, the suspension of specie led to a boom in the number of new banks started in the country, and a subsequent boom in note issuance. The war altered the economic pattern of production in a way very different from what would have evolved in the absence of war, and thus it placed the economy on a sandy foundation, vulnerable to distress when the war ended. Indeed, it was in this boom phase that the New York Stock Exchange was founded in 1817 — born in a bubble. So, when peace did come, the revival of foreign trade began to reverse some of the trends started during the war. Swelling imports led to falling commodity prices. "The influx of imports spelled trouble for war-grown manufacturers, especially textiles, which suddenly had to face the onrush of foreign competition," Rothbard notes. For the modern reader, this paints an all-too-familiar scene: the plight of the domestic manufacturer — one that continues to bedevil steel, lumber, and others today. As with all economic phenomena, however, there is crisis for some and opportunity for others. Exporters, for example, would thrive. There were many cranky and contradictory remedies proposed, and Rothbard reviews each one. But in the end, there was no widespread confusion on what caused the downturn. Instead, it was widely known that false prosperity is a very dangerous thing. It always turns to bust. Bad legislation failed to pass, the government embarked on no New Deal planning, and there was no great reflation. Precisely because there was no intervention, the panic ended quickly and peacefully. What we have here, then, is not only a dazzling historical account — the research here is deep and thorough, and the prose a model of exposition; it also points the way to how all economic downturns can and should be handled. For that reason, the Panic of 1819 offers important lessons for us today. The Mises Institute is pleased to present this very beautiful hardbound edition of Rothbard's most famous monetary essay.